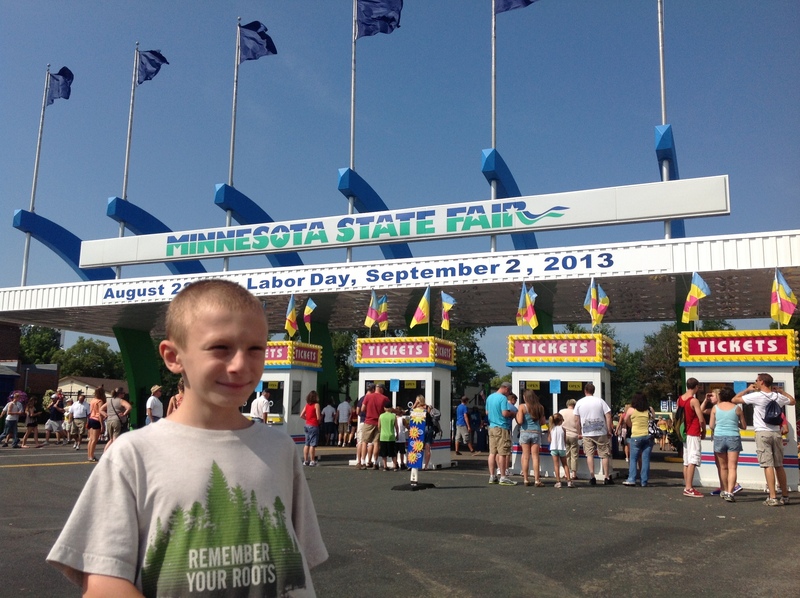 We went to the State Fair last week. Having wondered about the height of the Giant Slide, and having developed a technique for measuring things, we needed to collect the information required to answer our original question. The only problem? No one but me wanted to ride the slide. This is a big change from previous years. I went up alone in the name of mathematics. There are 104 steps to the top. I asked a young woman employee how many steps she thought there were. She said 108. I told her my count and she was ready to believe it. I asked a young man employee how many steps he thought there were. He had no idea. How can you work at the top of that thing and not be curious how many steps there are? In any case, should someone wish to check my work next year, I got 1 set of 20 and 3 sets of 28. I also took a kebab stick from Griffin’s dinner along with me. I broke it off at the height of one step partway up. I checked it against another step further up. Then I taped the stick into my notebook when we got home. May not be actual size on your screen. So then Griffin and I sat down one morning to finish this off. Recall our guesses of 40 and 45 feet. It was a fairly conventional conversation, so I’ll just list the bullet points instead of trying to reconstruct our exact words. I asked him to estimate the length of the stick, which he did—4 inches. He measured the stick with a ruler— inches. He suggested a calculator was in order. I suggested that this would not be happening. We sought to find . He naturally subdivided this into . His first answer to was 408; on further reflection he got 416. I was a useful resource for remembering intermediate results (such as the 116). Half of 104 was easy for him. We ended up with 468 inches. He knew we needed to divide this by 12. I modeled an intelligent guess-and-check strategy for doing this by asking him to guess. 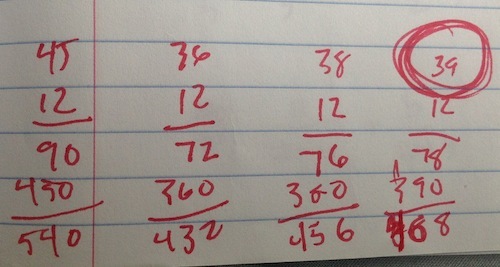 I did the multiplication. You can see the results below. Upon completion of our analysis, Griffin wanted to know how high the Sky Ride is. This entry was posted in Measurement and tagged 9 years old, giant slide, Griffin, state fair, summer project. Bookmark the permalink. I really enjoy your explorations with your children. I try different things and will be adding your ideas to my repertoire. Thanks. Can you please explain a bit more on how you calculated the height in this situation? Your bullet points appear to me to be rather cryptic! I intend to come up with a similar measurement related conversation with my 8 and 11 year old children.Thanks. Gladly, Amer. I do not wish to be cryptic! We assumed that each step is the same height, and that this height was the same as the length of the broken kebab stick. Griffin measured the kebab stick with a ruler and got 4 and 1/2 inches. 104 steps times 4 and 1/2 inches got us 468 inches. Inches were an unsatisfying unit for measuring the Giant Slide, so we wanted to get to feet. To do this, we needed to divide by 12 (there are 12 inches in a foot, so we wanted to know how many 12s are in 468). We were focused on a measurement task, not on learning division algorithms. Therefore, I chose not to go with a division algorithm for this computation. Instead, I had him guess how many 12s are in 468. His first guess was 45. That was too big. So he chose a smaller number, 36. That came close, but was too small. He chose 38 next. Then 39. Thirty-nine 12s is 468, so the Giant Slide is 39 feet tall. In each case, I did the computation to speed things along. And we have discussed that the kebab stick measurement is very good but imperfect. So we know that the Giant Slide is unlikely to be exactly 39 feet tall, and that about 40 feet tall is a very good answer to our original question. Excellent! Now that you know the height of the slide, you can calculate your potential energy and your velocity! What about measuring the elevation from two points and using trigonometry? That way you wouldn’t have to ride the slide. Yes. I could have done that, Jonathan. Griffin could not. I needed a strategy that was based on his ideas. In about 8 years, we may revisit this task and get a better estimate using more sophisticated mathematics. I would be surprised if our answer changes by more than 10% though. Thanks for reading. 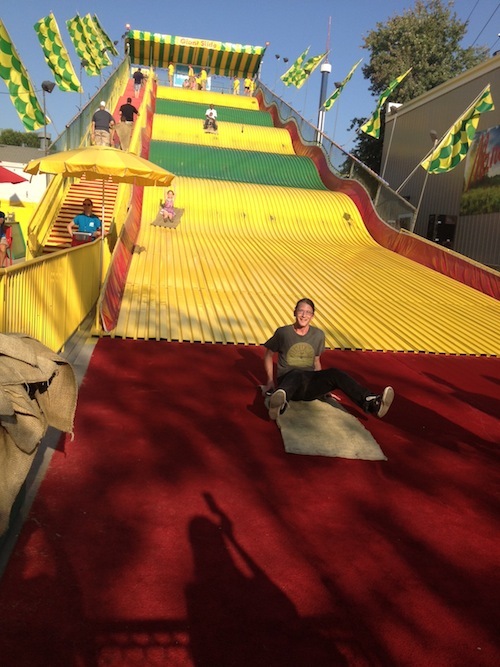 And if you ever visit the Fair to measure the slide yourself, please look us up, OK? We’ll show you around!